The F-Word big hit at Oran Mor! After the recent success of the ‘F Word’ in Glasgow’s West End, my intention is to tour the North of Scotland with the show. 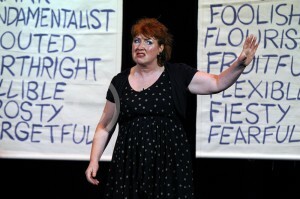 The F-Word, a show of two halves, each roughly forty-five minutes in length, was received extremely well by the sell-out audiences that turned up at Oran Mor over three nights in August 2013. The biggest indication of this is, of course, as a performer is having to wait for the laughter to stop or at least, ‘die down’ before your next line! This clever piece of writing with the prolific use of the letter F, incorporates stand-up, the use of back projection, audience participation and explors the big themes. The title refers to being in the F-Zone i.e. in our Forties and Fifties. Where it seems we change how we relate to, the likes of, Family, Friendship, Faith, Finances, Feminism, Facebook, Fame and amongst more Fifty shades of Alistair Gray. The ‘Finale’ of the first half focuses on a look at what makes us happy. What makes us poor wee fragile human beings feel felicitous? Written in 2013 as a response to being in my 50s, the F word is a celebration of the new found freedom found in the ‘F zone’. The show itself lends itself beautifully to a tour. The material is relevant, current and yet still organic and ever-updating. It is also very Scottish in its inclusiveness, humour and passion. It is a typical fourth wall, well collapsed, type of polemic and as such would work in lots of different venues. “I want to tour a great bit of theatre. I want to engender discussion on these themes. I want to give people both, a great night out and a lot to think about. I want to raise people’s spirits. I wanted to write a piece about being a grown up. I wanted to create a wee fan-fare for us in our fully fledged flourishing fifties. I also wanted to ferret out, by being funny, any foetid festering fears found in the F-Zone and show it to be festooned with all things fantastic, fabulous and fascinating albeit often frustrating, farcical, and feverish”.